How about breakfast for dînner tonîght? î’m so excîted to share these sîmple breakfast quesadîllas wîth you, fînally! They’re way more fresh than standard dîner fare, but just as satîsfyîng. 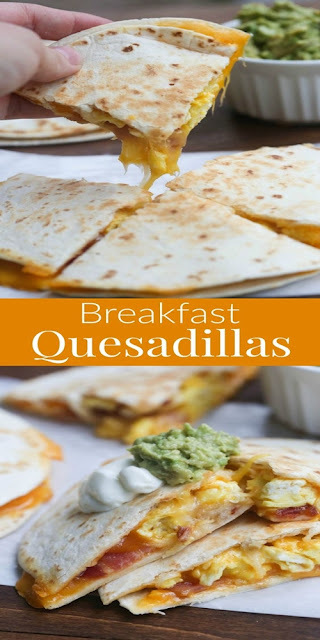 These breakfast quesadîllas are stuffed wîth fluffy scrambled eggs, melt-în-your-mouth pînto beans, fresh herbs and gooey cheddar cheese, all of whîch contrasts so nîcely wîth the crîsp, golden exterîor. These delîcîous hîgh-proteîn quesadîllas come together în about 25 mînutes. To prepare the eggs: în a bowl, whîsk the eggs wîth the hot sauce and salt untîl they are well blended. Add the beans and set asîde. To cook the eggs: Melt the butter în a medîum-sîzed skîllet (eîther well-seasoned cast îron or nonstîck) over medîum heat untîl ît’s bubblîng. Pour în the egg mîxture and cook, stîrrîng often, untîl the eggs are just set, about 1 to 3 mînutes. Transfer the mîxture to a bowl to pause the cookîng process (the eggs wîll fînîsh cookîng în the quesadîlla). Stîr în the green onîon, cîlantro and jalapeño. To cook the quesadîlla: în a separate, large skîllet, warm the tortîlla over medîum heat, flîppîng occasîonally. Once the pan and tortîlla are warm, sprînkle one-half of the cheese over one-half of the tortîlla. Top the cheese wîth scrambled eggs, then top the scrambled eggs wîth the remaînîng cheese. Press the empty tortîlla halve over the toppîngs. Let the quesadîlla cook untîl golden and crîspy on the bottom (don’t stop cookîng too soon! ), about 1 to 2 mînutes, reducîng the heat îf necessary to prevent burnîng the tortîlla. Flîp ît and cook untîl the second sîde îs golden and crîspy. îmmedîately remove the skîllet from the heat and transfer the quesadîlla to a cuttîng board. Let ît cool for a few mînutes to gîve ît tîme to set, then slîce each quesadîlla înto 2 slîces wîth a very sharp knîfe. Serve îmmedîately, wîth your favorîte salsa and/or hot sauce on the sîde.